It’s important to know that every message has a fact and a feeling part. One must identify both parts in order to deal with a conflict effectively or to communicate clearly. This is a Kathy Observation, not researched fact, but I’m pretty sure that you cannot create psychological safety and strictly stick to facts all the time. We are humans, and humans have feelings. As leaders, we don’t have the luxury of ignoring them. I learned this lesson late in life, and it would have saved me some time and trouble if I’d known about it sooner. For 20 years, I led volunteers as an Army spouse. In one group that met monthly, there was one young woman who always sat at my right hand and objected to everything that the group proposed. She objected on a factual level – logistics, budget, convenience. She slowed us down every single month. If I’d been savvier, I would have figured out that it wasn’t the facts that she objected to. I had a vague notion that she was unhappy or resentful, but I had no idea why. There was a feeling component that I wasn’t dealing with at that time. If I’d asked and listened, I could have saved us a lot of time arguing over facts for no good reason. Now I pay attention to everyone’s nonverbal communication and ask about any telltale signs of an emotion. People often agree with something or say that everything is fine while their nonverbals say exactly the opposite. Crossed arms, furrowed brows, and a lack of eye contact are all indicators that they don’t agree and everything is not fine. They will carry those unexpressed feelings out the door and stew in them if I don’t bring them out in the open by asking some questions. It can feel scary to voluntarily dive into the ocean of emotions. The water is murky and deep, and you have no idea of what lurks down there. Take heart! First, leadership requires bravery – so take a deep breath, and go for it! Second, naming an emotion that you see and asking about it can create an uncomfortable situation, but it isn’t fatal. In the workplace, you generally get an explanation for the emotion that makes a lot of sense and gives you new information. The answers can be surprising – something that you wouldn’t have guessed. We can only create psychological safety if we deal with both the facts and the feelings of individuals. The only way to identify the feeling part of a situation is to ask! I’ve talked with several people over the past few weeks about how to begin the difficult conversations that are the hallmark of psychological safety. Even if the group has norms in place that encourage people to challenge one another and to offer diverse ideas, it can feel intimidating to bring up a subject that is going to create some conflict. A great way to start is with a CAR; it’s a feedback tool that includes Circumstances, Action, and Result. This format works well because it encourages us to talk about facts. Our discussions stay grounded in objective, observable behaviors. We begin by discussing the circumstances surrounding the action we want to talk about. We clearly outline when it happened and what was going on. For example, we might start with, “Yesterday when we were trying to get the order shipped for XYZ.” That tells the person or group what situation you are talking about. Then we move on to the action or procedure that we want to discuss. We might say, “Fred followed our required procedures to get the order out the door.” It’s important to stick to observable facts and use no colorful adjectives or adverbs like “archaic” or “stupid” when describing the procedure or action – or a person, for that matter! Then we explain the results of the actions. As much as possible, we want to make these business results – how the actions impacted the organization and group goals. If we continue with our example above, the results might have been that we did not get the shipment out on time because the required procedures include a lot of paperwork and time. We damaged the relationship with the customer, and our reputation for reliability was weakened. All of those results will make it more difficult to keep and gain customers. After describing the circumstances, action, and result, we can offer an alternate action that would have been more useful. In our example, we might offer ways to streamline the process so that it takes less time. We could also ask for other people’s ideas about how to get orders shipped more efficiently. It’s important to talk about the positive outcome that would happen with the new actions so that everyone stays focused on a positive business result. In our example, if we improve the shipment paperwork process, we can meet deadlines more easily, get more done faster, and maintain our reputation for reliability. The beauty of the CAR format is that it helps to keep the conversation grounded in observable facts and desired business results. It keeps a group from blaming each other and going over past events. The focus is on achieving outcomes that help everyone. 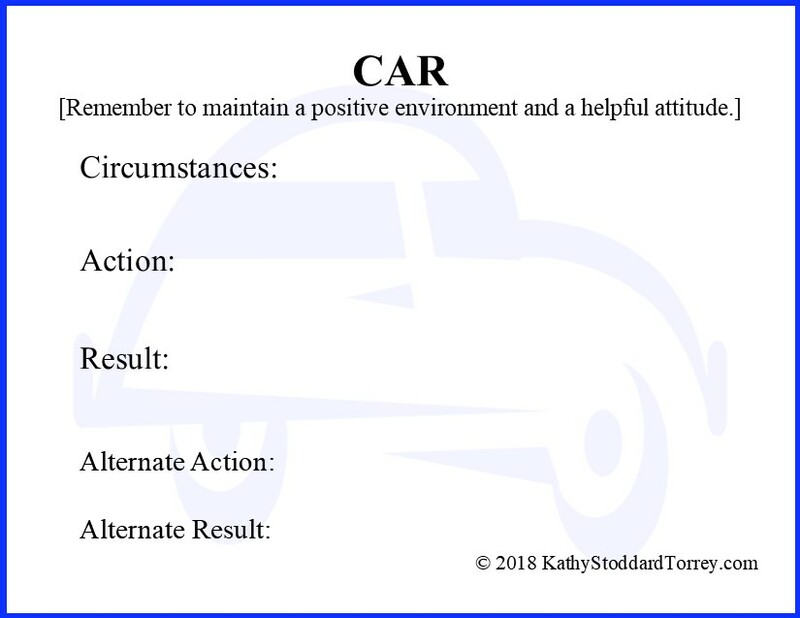 Before we begin a discussion using the CAR format, it’s important to set our intention to create a positive, helpful environment for the conversation. Our purpose is to create success for the group and the organization, not to prove anyone wrong. We must maintain a helpful, positive attitude. We do not want to carry an adversarial attitude into the discussion. The CAR format can be used to give any kind of feedback. In leadership workshops, we practice using it to give positive and developmental feedback to employees. We can use the CAR format to let someone know the specific action that he or she took that helped the team and organization. Remember, we want to create positive relationships and comment on the good things that we see as often as possible. The CAR format is great for giving positive feedback because it tells the person exactly what they did that was useful and the good effect that it had for the business. Whenever we see someone doing something that we’d like to see them do again, we should give them some positive feedback on it. Appreciation is one of the biggest motivators for people. Printing the CAR .pdf and using the individual CAR formats to keep track of feedback that we’ve given is an excellent practice. You can download a copy under the “Free Stuff” tab on my website. It’s a good way to collect information that we will need when we give performance reviews. It can be difficult to remember the actions of all of our employees over time. It’s also a good idea to use the CAR format to keep track of our own actions. Our supervisors might not notice everything that we do. If we take a minute to jot down things we do, both good and not so good, we have specific examples to offer during our performance reviews. We can say, “I think I’ve done this well, and here are some examples.” Be sure to date the CARs. When asked what we need to work on, we will have already identified areas that we want to improve. If by chance our supervisors say that they think we need to improve in a certain area in which we have actually had some success, then we have ready examples of specific circumstances and our actions in those circumstances. Maintaining a fact-based conversation with a positive attitude supports an environment of psychological safety. The CAR format can keep us on track and give us courage to start difficult conversations. As I’ve been imagining what a psychologically safe environment looks like, I’ve seen it as animosity- and sarcasm-free. I felt like getting rid of active aggression would solve the problem and make people feel free to share their opinions and take risks. As I’ve watched the world around me, I’ve realized that another huge obstacle to psychological safety is indifference. Mostly, it shows up as not being fully present and attentive during a conversation. The goal of a great leader is to create positive relationships. We know from Google’s Project Aristotle that exceptional teams have psychological safety, which does, in fact, create and foster positive relationships. One of the ways to create positivity in a relationship is to pay attention to the other person and actively listen to what he or she has to say. We also know that positive relationships require a positivity interaction ratio of at least 5:1, which means that we must have about five positive interactions for every negative one. In one study, asking a student how homework was going turned out to be a negative interaction. For the purposes of maintaining the positivity ratio, a negative interaction doesn’t have to include animosity or anger; it just won’t be positive. When we continue to type on the computer while talking to someone, we are having a negative interaction because we are not making the other person feel valued. We are sending the message that what they are saying is not as important as what we are typing. In workshops, I hear complaints over and over about bosses who don’t stop what they are doing to actively listen to what someone is saying. Each and every interaction builds positivity and, hence, psychological safety, or damages it. Dr. John Gottman, a well-known researcher on successful relationships, calls them “sliding-door moments,” after a Gwyneth Paltrow movie called Sliding Doors. In the movie, Paltrow’s character decides to go home because she isn’t feeling well. We first see her miss a train in the London tube. She goes home and uneventfully climbs into bed. Then the scene replays, and she catches the train. She gets home earlier than she did in the first scenario and catches her boyfriend cheating on her with her best friend. If we pay attention to someone’s emotions and need for connection, we help to create psychological safety and a positive relationship. When we ignore or dismiss a person’s bid to connect, we damage the relationship because we damage trust. 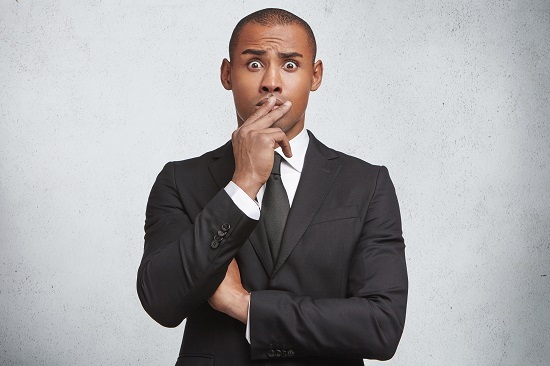 Each bid is really asking the question, “Can I trust you to respond to me as a person you respect and care about?” Make no mistake, leaders must care about the people who work for and with them. Lately, what’s brought home the danger of not being fully present for me has been watching parents and children. 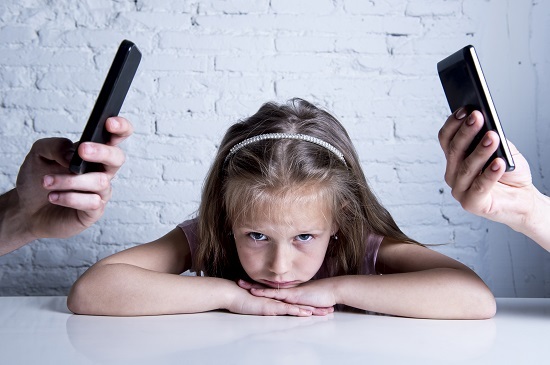 I’ve noticed a lot of children staring off into space while a parent talks on the phone, reads a book, or plays a game. It breaks my heart. A charming child who makes bids for interaction with an adult is ignored. What conclusions is the child making about the parent? It is an accumulation of moments that leads to a certain outcome, so I’m not saying that we need to focus every moment on our children. However, if we are physically present with a child or adult and pay attention to something besides him or her, we are saying that the person is not as important as what we are doing. We combat the challenge of indifference by being fully present in each moment when we are with others. We pay attention to them, to what they are saying, to their emotions, to their body language, and to their message. We show them that they are worthy of our time and attention, and in that moment, we are focused on them. I heard the retired CEO of Campbell Soup Company, Douglas Conant, talk about his book TouchPoints: Creating Powerful Leadership Connections in the Smallest of Moments. He said that he used to view interruptions by his employees as annoying intrusions. He felt like he couldn’t walk down the hall without being pestered to pieces. Then he made a mindset shift and looked at each one of those moments as an opportunity to reinforce company values and provide encouragement. In other words, each interaction was a sliding-door moment, and he got to choose how to act and react. Conant advocates for pausing and being fully present instead of hurriedly brushing the person off. Seriously, wouldn’t the world be a great place if we inhabited each moment and turned towards the people around us? In her work on increasing positivity, Barbara Fredrickson found that micro-moments of positivity with complete strangers can increase our own feelings of positivity. We get something out of paying attention to others! I’ve had some great and brief conversations while waiting in line at the grocery store when I’ve chosen to look at the people around me instead of at my phone. Psychological safety, trust, and positivity are things we create one moment at time, but only if we intentionally choose to fully inhabit those moments and give the gift of our time and attention to others when it is asked for. I’m still fascinated by Negative Sentiment Override (NSO) and how it affects psychological safety, which influences our lives at home and at work. We’ve talked about what NSO is and that it’s hard to recognize it in ourselves. We’ve also discussed that we can’t force anyone else to stop being negative. The only person that we can change is ourselves. So far, we’ve talked about one-to-one relationships, which the research on NSO supports. As far as I know, research on NSO has been done with couples in mind. I want to extrapolate the findings to other scenarios and want to be clear that we are now moving into Kathy’s musings and away from proven research. As I’ve viewed the world lately through the lens of NSO and Positive Sentiment Override (PSO), I’ve noticed that some people seem to be in a state of NSO towards entire groups – not just one individual. Of course, the most glaring, public example is of conservatives and liberals. I have friends in both categories, and what strikes me is their inability to see any good in what the other group says and does. It feels like a values issue, which means we feel most strongly about it. If we are in NSO, every action is an insult and we are enraged by them. However, if we are in PSO rather than NSO, we recognize neutral and positive actions and comments from the other side. It’s important to remember that a state of NSO distorts our view of reality. We aren’t seeing things accurately. In a sense, we are demonizing people and groups with our interpretation of their words and actions. Honestly, it takes very little effort to put a negative spin on anything, and in NSO we are making up other people’s motivations. Keep in mind that we don’t know what anyone is really thinking or why they do things unless we ask. We usually don’t ask because we surround ourselves with people who share our values and think like us. They reinforce our beliefs for us. We also scan the world for things that support our slanted view. We do not register facts that would support an opposing view – either because we don’t get those facts because we insulate ourselves, or we don’t notice. Remember, a partner in NSO misses 50% of the positive gestures of the other person. Let’s go one step further. I’ve noticed people who have an NSO mindset about everything! I think it’s what I’ve considered a “victim mentality.” In NSO, a person is overly sensitive and hypervigilant for putdowns. I know people who live in that state. They cruise through life determined to be insulted by almost everything. They take the circumstances of life and most interactions with others as personal affronts. All of this makes me very nervous about the accuracy with which I view people, groups, and the world. What positive things am I missing? What neutral things am I moving to negative? Honestly, it feels a little like an episode of The Twilight Zone. It makes me wonder, am I in NSO towards any one person, group, or the world? How would I know? If I am in NSO, my view of reality is distorted. I am not seeing 50% of the good things about a person, group, or the world. If all that is true, wouldn’t I feel justified in my animosity and anger towards them? On the whole, I don’t live in a state of anger. I don’t feel like a person or group’s actions are a personal affront. There are groups that I don’t agree with because they do not value what I value. Their actions might make me angry, but it isn’t a permanent state. I don’t even hate these people. And bingo! Here is our second hint about whether or not we are in an NSO state. We could ask, “Do I hate this group, this person, or the world?” It’s important to see other people as people, and not as objects. It’s really hard to hate someone who we view as having thoughts, dreams, and rights equal to our own. In my experience, most people do what they believe is right based on their own experiences, values, and beliefs. Yes, people caught in NSO who cannot see any part of the other’s perspective are particularly annoying, but we cannot force them to change. We can only invite the behavior we’d like to see by showing them what positive and open-minded look like. I feel that I could easily slip into an NSO state with a group. When we join a group that is in NSO, everything feels certain and comfortable. We all believe the same things, and there is a strong sense of belonging because it is us against them. It’s comfortable and not confusing at all. Everything is clear because we have taken a reality full of grays and made it black and white. And bingo! Our third indicator of being in NSO is an absolute feeling of superiority of belief and value over another person or group. Am I angry a lot of the time? Do I feel insulted often? What am I spending my emotional pennies on? Do I hate this group, person, or the world? Do I feel superior to another person or group? Am I completely confident that my way of thinking and believing is the only right way? Awareness is a first step to wisdom and control. Anyone who knows me knows I like control. Wisdom is something I’m always working on.